Cleans crayon, pen, scuff marks or hard water stains. White layer acts like an eraser. It breaks down as it cleans. 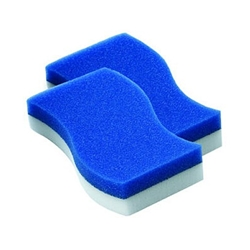 Foam material cleans without using harsh chemicals, while the durable blue urethan layer keeps your hands out of the muck. 2 pads per pack.